Freelancers of North Jakarta Environment Dept. have been transporting three tons of garbage. 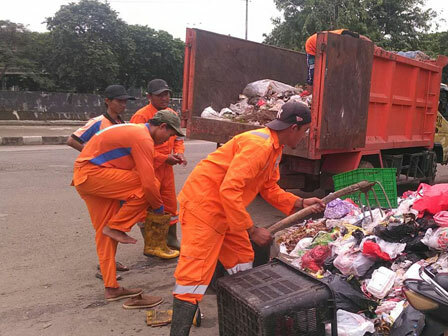 Garbage is transported from an illegal garbage disposal site (TPS) on Jalan RE Martadinata, Sunter Agung Urban Village, Tanjung Priok Sub-district.
" We also put up a banner ban on littering at the location"
Mumu, Head of Executing Unit for Tanjung Priok Sub-district Environment Sub-dept. said garbage piles up on a sidewalk towards residential area. "Garbage is from the TPS," he told, Saturday (4/8). To clean up it, seven freelancers and one dump truck are sent to the location. "We also put up a banner ban on littering at the location," he stated.